Continuity testing is the act of testing the resistance between two points. If there is very low resistance (less than a few &ohm;s), the two points are connected electrically, and a tone is emitted. If there is more than a few &ohm;s of resistance, than the circuit is open, and no tone is emitted. This test helps insure that connections are made correctly between two points. This test also helps us detect if two points are connected that should not be. Set the multimeter to 'Continuity' mode. It may vary among DMMs, but look for a diode symbol with propagation waves around it (like sound coming from a speaker). Continuity is a great way to test if two SMD pins are touching. 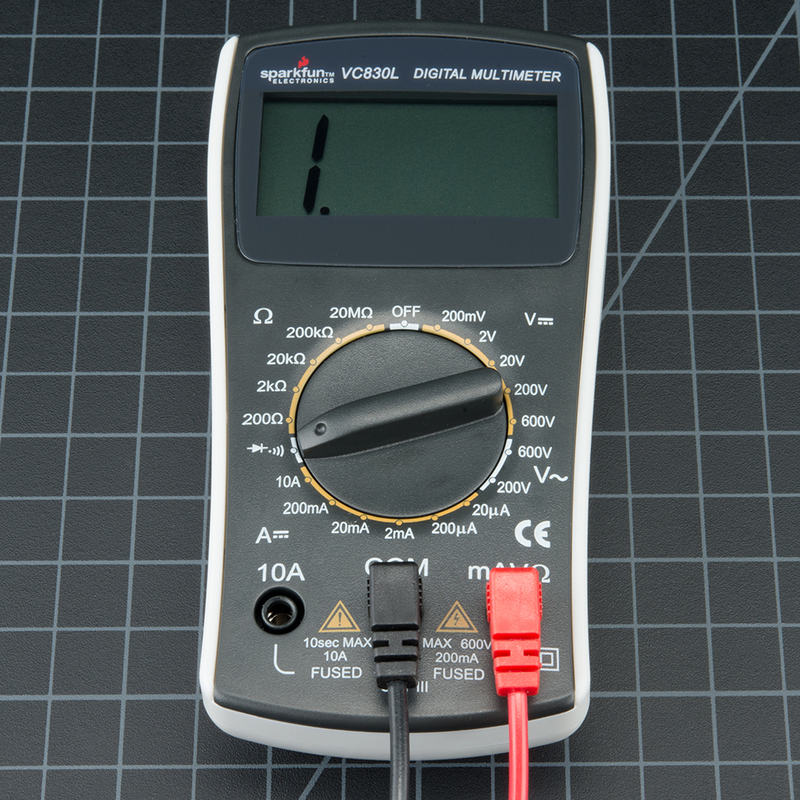 If your eyes can't see it, the multimeter is usually a great second testing resource. Power the system down and check continuity between VCC and GND. If there is continuity (if you hear a beep), then you've got a short somewhere. Continuity and large capacitors: During normal troubleshooting. you will be probing for continuity between ground and the VCC rail. This is a good sanity check before powering up a prototype to make sure there is not a short on the power system. But don't be surprised if you hear a short 'beep!' when probing. This is because there is often significant amounts of capacitance on the power system. The multimeter is looking for very low resistance to see if two points are connected. Capacitors will act like a short for a split second until they fill up with energy, and then act like an open connection. Therefore, you will hear a short beep and then nothing. That's ok, it's just the caps charging up.